This is Dot, my folding bike. My father bought me this bike because each time I come back to Hong Kong, I can't wait to go back to Sydney, and it's just so obvious what I miss the most. The "see you next year" photo from January 2009. I don't even get this sentimental saying goodbye to people. It will be time to say goodbye again in the morning. This time, I had a summer job here, so I actually get to commute on Dot. Yes, it's the same dashboard I normally have on Crescent. The handlebar on Dot is shorter, and the air horn doesn't fit so well. There must be a kind of tree paranoia lurking in the back of cyclists minds, on the few occasions I've locked my bike to a post-sized tree have almost always walked away thinking like that! Maybe I'm ridiculous too....sigh. I think the person asking the question was intentionally making fun of me, especially since I used two locks (a U-lock and the lock I normally use in Sydney) so the idea was that it might actually take less time to cut the tree than to cut both locks. The locks didn't stop me from worrying, but they kept Dot safe and I rode away into the sunset after my last day at work. Nice bike Kerry. Love the matching gumboots. What sort of bike is Dot? Nice! How is your brompton going after a few years of riding? Sorry for the very late reply but I dont follow this site often. I thought that I had it good riding since 2008 but so far 2011 has not been a good year and I am not sure if it starts to wear out due to my extensive riding in hilly Sydney. My chain broke, I had to replace the cogs, had a collision with another bike, a slashed tyre from a can, a puncture from a nail. 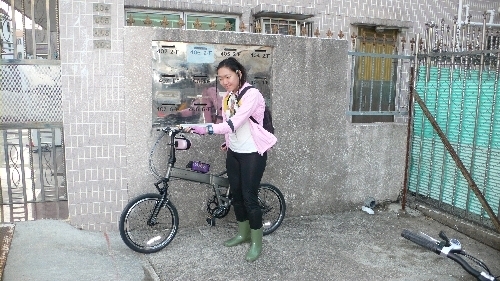 HOWERVER, I dont regret the buy and will replace it with a new Brompton when the day call for one. Bickerton Portable I bought at a garage sale. Use it once a year when I take the car in for a service, to ride home on. It has a 3 spd SA which is too high around here, and the front ring is huge. Any ideas on where to get some alternatives? The U shaped handlebars can rotate backwards, rather disconcerting. There is a stop to prevent them rotating forward. How many teeth are on the rear sprocket on the Sturmey-Archer hub? I reckon it is probably 13 or 14 teeth only. You can replace it with a larger 16-tooth sprocket (common item found on most Kid's coaster-braked BMXs) which will reduce the gearing to a more comfortable spread. The Raleigh Twenty was supplied with a 15-tooth sprocket as standard, although many people switch it out to a 16 or 18-tooth sprocket for a better spread of gears. Probably not much you can do about the front chainwheel without replacing the whole crankset, but SA make up to 24T for the rear and you could go larger using a Shimano cassette sprocket with the extra centre lugs filed away (Sheldon describes all this, its quite simple). You'll need to lengthen the chain to suit. Seems almost every hub geared bike has this problem of over gearing, which is great pity as I suspect it has made hub gears a lot less popular than they should be. Here's my Brompton. A standard 2010 M6L model, with upgraded Brooks B17 Special saddle, Brooks grips and Shimano R770 brake leavers to replace the standard plastic ones which seemed unnecessarily cheap and tacky in my opinion. Oh, and a Zefal Cyclop bar end mirror. I've used one of these for years on one of my other road bikes and wouldn't be without one now. Turns out to be a good fit with the Brompton fold.